Don Pinson, N7DPP agreed to trade his used Yaesu FT-897D for my new iPad. We agreed that we will each pay shipping, insure it and provide a tracking number. My iPad was sent out on tuesday the 12th, February 2013. According to N7DPP, (Don Pinson) He did the same. My tracking number was valid and I followed my Ipad online, watching it pass through mail centers and eventually leading to his doorstep. The entire time this was happening, Don Pinson said the tracking number was "just delayed" and then the story changed to "the radio is lost in the mail" I've never had a single package lost, EVER. So, to my suprise I get a email from Don stating that my iPad was not sent complete, as it was without the registration card and manual. Anyone that has knowledge of ipads or iPhones knows they don't come with manuals or registration cards. According to Don Pinson, N7DPP, he has previously owned a iPad, and I find it SHOCKING that he is asking for something that does not exist in the "apple world". Now, even though Don said the ft-897d was "lost", I get a email on Sunday the 17th stating that he "got it back" (odd, I guess only in WA postal services are open on sunday) He claims that still the iPad is without the registration card and manual. I emailed him back stating that again THEY DO NOT COME WITH MANUALS OR REGISTRATION CARDS. So, after a full week of talking to my fellow hams I get a message on my phone this morning stating Don Pinson N7DPP is now selling a screwdriver antenna. I go to the link http://swap.qth.com/view_ad.php?counter=1047823 and to my suprise (not really suprised) there in the background in his photo is my iPad, with grey belkin cover getting a nice charge, and to the left under a stack of papers and his glasses is the Yaesu FT-897D that was supposedly "lost in the postal system". Now, I have proof he has accepted and is in posession of the iPad, and is still in posession of the Yaesu FT-897D.....Hello fraud alert. Don, you have to the end of the day today to mail out the Yaesu, or return my iPad or I am calling the police. Do whats right, be a man and admit your hands have been caught in the cookie jar. The evidence is pretty strong as you can see. for all of you other Hams, I'm not the only one who's had to deal with Don Pinson N7DPP. 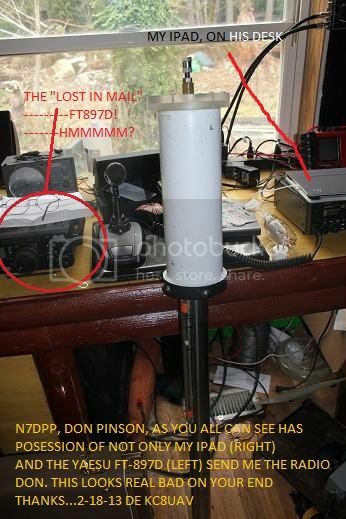 As a matter of fact, the other people with stolen items hae almost a identical story as mine.....Apparently Don Pinson, N7DPP (WHO'S CHANGED CALL SIGNS MANY TIMES) is the only man on earth to have a 100% failure rate with our tried and true postal system. Here is some links to prove my point. Don Pinson was already blocked from the QTH.com Classifieds, but under his old callsign of AA7DP. I see now he has changed callsigns to N7DPP, so I have now blocked that callsign as well. I hope that you find some resolution to your problem. It may be advantageous to contact the local law enforcement in his home town. Sometimes a knock on the door from someone with a badge gets progress quick. They aren't required to help, but sometimes local law enforcement will help anyway. Thanks, need all the help I can get. I've already opened a case with IC3, I am also gettign in touch with the sheriff out there, also calling FCC about prohibiting future call sign changes. He picked the wrong guy to mess with. To make matters worse, now he claims my brand new iPad that I just sent out insured, is now "not working right".....these crooks just dont know when to stop. Don Pinson (N7DPP) has updated his call again as of 2013-03-14. It is now NA0DP....BUYERS BEWARE. File CRIMINAL CHARGES against him. Do it yourself. The Postal Inspectors don't look at anything under $300.